Your garden will continue to burst with bloom when you fill it with other flowering perennials and shrubs that bloom into September and October. All are highly recommended by Aaron Steil, horticultural manager at Reiman Gardens in Ames. 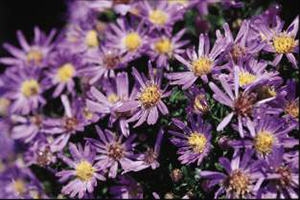 · Asters (Symphyotrichum) The daisy-like flowers come in primarily pinks and purples. · Goldenrod (Solidago) These native prairie plants burst into plumes of small yellow flowers. · False sunflower (Heliopsis helianthoides) Towering 3 to 6 feet tall with bright yellow daisy-like flowers. · Turtlehead (Chelone lyonii) Pink shell-shaped flowers bloom in late summer, preferring wet soils. · Autumn crocus (Colchicum) These bulbs produce leaves in the spring that die back to reveal large pink crocus-like flowers in fall. · Sweet autumn clematis (Clematis terniflora) A vigorous twining vine covered in small white honey-scented flowers each fall.